On a warm and sunny Saturday afternoon, 8th March 2014, I went along to Nack 5 stadium to watch the Squirrels take on Nagoya Grampus. To be honest I was lacking confidence, even with Grampus having lost their opening season game 3-2 at home to S Pulse. Ironically they had lost to a goal fired in by former Ardija favourite Novakovic. Furthermore Nagoya were also getting used to a new manager in Akira Nishino, who had replaced Stoijkovic. A crowd of just under 10,000 gathered at the stadium, suggesting that a lack of optimism for the new season had spread to the fans who had been enticed in when the team had been sitting on top of J1 under coach Verdenik. Omiya set up 4-4-2 which was a change from the first game when we had started the game with just one up front. The change in personnel was Zlatan coming in for Cho. 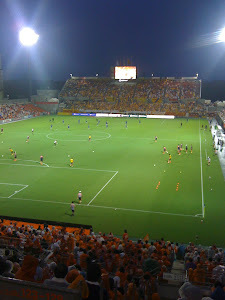 The first half was very disappointing for Omiya. I cannot remember any serious effort on the Grampus goal. Worse still, the passing was poor, teammates didn't seem to be able to find each other, and control was often poor too. It did not make good watching for Ardija fans. Nagoya played the better football in what was in all honesty a lacklustre first half. Tulio was hardly troubled in defence at all. Danilson looked strong, driving forward. Kennedy and Tamada were probing in the Omiya penally area, but as yet to no effect. At half-time it was 0-0. The second half began in much the same way and on the 53rd minute Nagoya got the breakthrough that had seemed to be coming for a while. Kennedy played a neat pass through to Tamada. The Omiya defenders stood and called for an offside decision, which was not forthcoming, and Tamada had the freedom of our penalty box to finish smartly. Omiya were still struggling to launch any serious attacks, yet it was Nagoya who made the first changes to their team with a double substitution on the 61st minute. Nagai came on for Edamura and Taguchi came on for Isomura. A few minutes later and Grampus extended their lead, when a rare Ardija period of possession broke down just outside the Grampus penalty box, from the defensive tackle the ball went to Ogawa deep in the Nagoya half, but he was able to run the length of the pitch almost unchallenged and finished easily past goalkeeper Shimizu. Kikuchi tried to make a challenge on Ogawa as he got into our penalty box, but just stumbled and fell over, making Ogawa's finish even simpler. Strangely enough, going 2-0 down at home, finally brought some better play from the Squirrels. The team managed to keep possession longer and start to stretch the Grampus defence. At last that defence was breached in the 70th minute when Takahashi finished off a neat Ardija move, and put the ball home from close in on goal. The fans started to believe that just maybe a draw was possible. So Omiya have lost their opening two games. Obviously this is not a good situation to be in, and as soon as I left the stadium I began to check results elsewhere. This could be a regular feature of this season, as I expect the relegation struggle to be tight. It is disappointing to feel the extent of our ambition is to hope those around us drop points. Already many pundits are suggesting Tokushima will go straight back down. If that is the case, Ardija are fighting to avoid two spots. Can we do it? On the positive side, the last twenty minutes were better. But then again, what came before was pretty poor. The players have to work hard in training, because on the pitch they still look like they are getting to know each other. The most impressive player for Ardija in this game was the Brazilian Carlinhos, and he didn't enter the game until the 71st minute! Next up for Omiya is an away game against Kawasaki Frontale. Although Frontale are only in 14th position at the moment, they have some good players and Ardija will have to improve on this performance, if they are to pick up their first points of the season. I would like to see Carlinhos start the next match. Finally, what has happened to Tomiyama?